Greece's Prime Minister Alexis Tsipras attends his cabinet's swearing in ceremony at the presidential palace in Athens, Sept. 23, 2015. 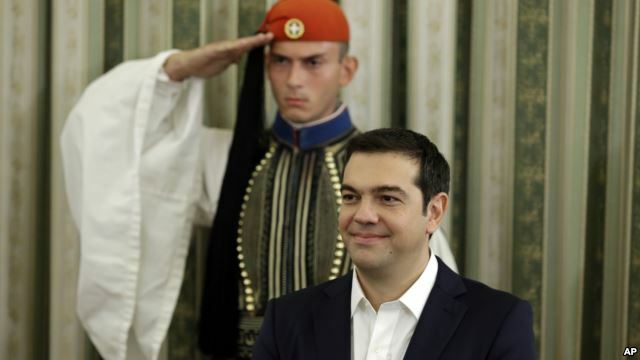 Greece's new coalition government formally assumed its duties Wednesday, pledging to enforce creditor-demanded spending cuts and reforms while softening the pain on an austerity-weary population. Labor Minister George Katrougalos said the new administration elected Sunday has to focus on the reforms that were a key condition for the latest in a series of international bailouts keeping the country afloat. "Until now the people knew us and backed us as a force of resistance to neoliberalism, establishment politics and corruption," he said at a swearing-in ceremony for Prime Minister Alexis Tsipras' new government. "Now we must prove that we are also a force for reform." Tsipras, at 41 Greece's youngest prime minister in about 150 years, won re-election in the early election despite a rebellion in his party after his remarkable policy U-turn in the summer, when he broke key promises to fight bailout-linked austerity and instead signed a new bailout with even more tax hikes and income cuts. "It would be naive to say that our path will be strewn with flowers," Deputy Prime Minister Yiannis Dragassakis said. "it will be an uphill course, but there is optimism that we have some time ahead" in which to formulate policies, he added. To secure the 86-billion-euro ($96 billion) rescue loans, Greece has committed to further reduce pension spending, overhaul the pension and social security system, double taxation on farmers, open restricted markets to competition and push ahead with a large privatization program. Tsipras' new government retained the core of his previous Cabinet with a few tweaks. These included Yiannis Mouzalas, the widely-respected immigration minister in the caretaker government appointed before the elections, who will remain in his post. Immigration is a key challenge for Greece, which this year has received more than 260,000 refugees and economic migrants, who cross in rickety boats from Turkey on their way to seek asylum in more affluent European Union members. Tsipras flew later Wednesday to Brussels for an EU summit on immigration. 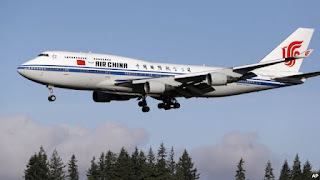 The Air China Boeing 747-400 plane carrying Chinese President Xi Jinping flies over a line of evergreen trees as it heads in to land, Sept. 22, 2015, at Boeing Field in Everett, Wash.
Chinese companies have agreed with Boeing to buy 300 jets and build an aircraft assembly plant in China in deals signed during President Xi Jinping's visit to the United States, the official Xinhua news agency said Wednesday. China Aviation Supplies Holding, ICBC Financial Leasing and China Development Bank Leasing inked the jet purchase agreement after Xi's arrival in Seattle, Xinhua said. It did not give details of the plane models involved or the deal's value. State-owned Commercial Aircraft Corporation of China, which is better known as COMAC, also signed a cooperation agreement with the U.S. plane maker to build a 737 aircraft assembly center in China. Xi is due to visit Boeing's Paine Field assembly plant during the Seattle leg of his trip before moving on to Washington, D.C. to meet President Barack Obama. The assembly plant would be Boeing's first in China and signals its attempt to match its European rival Airbus's Chinese presence as the two rivals step up their efforts to win more business in the country's lucrative aircraft market. Airbus opened its first assembly line outside of Europe in 2008 with a Tianjin facility that turns out four A320 aircraft per month. In July, Airbus signed a deal for a second completion and delivery center for A330 jets. Boeing sold a record 155 airplanes last year to customers in China and so far this year a quarter of its jets have been delivered there. The company predicts that over the next two decades China will overtake the U.S. as the world's biggest plane market with demand for 6,330 new airplanes worth an estimated $950 billion. China's state planning agency also signed an agreement with Boeing to promote cooperation in the aviation industry, Xinhua said.